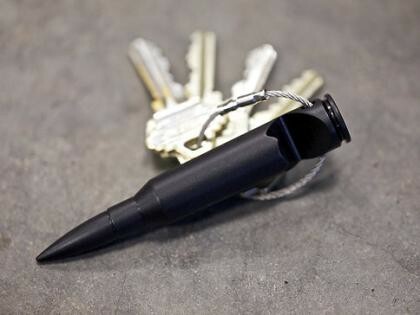 Battle Opener™ Personal security weapon and bottle opener. This keychain is a stealth way to open beers or go into protection mode if your life is threatened. It's beefy design is after one of our favorite rounds, the .338 Lapua, but on steroids. Made from aerospace grade aluminum and hard anodized, the Battle Opener is virtually indestructible, lightweight and a great security companion. The braided stainless steel key-chord locks and unlocks to add or remove your keys, or simply add your keychain hoop to it. Don't be caught off guard and fail to protect yourself or be unprepared at a BBQ.